The receiver did not have any output on any of the channels. The display turned on just no output. First thing I did was download the service manual. I checked for blown fuses and obvious burnt components. Not finding any on the first pass. I noticed that the protection relay did not engage to apply the electricity to the main output transistors. Therefore, I checked the large output transistors. Since these transistors are BJT based, I can do a rough test with the multimeter “diode” setting. The two output transistors in the DE845 are the MN2488 (NPN) and MP1620 (PNP) in a “totem pole” configuration. BJT transistors have a diode junction on the base-emitter and base-collector junctions. These transistors are both Darlington type – meaning two “stacked” transistors in one package. The test is the same. The forward voltage will be different due to two sets of diode junctions in the path of the meter. This is a quick test to see if the transistor is shorted. Putting the positive probe on the base and the negative probe on the collector or emitter should read a forward voltage of about 0.6V. Putting the positive lead on the collector or emitter and the negative on the base should read infinite voltage. The resistance between the collector-emitter should be large (not zero). Same as the NPN transistor test, just the lead polarity is reversed. I found that both the NPN and PNP transistor on the left channel was shorted- Q506(PNP MP1620) and Q507(NPN MN2488). Q506 was open circuit from base-emitter and Q507 was shorted from collector-emitter. The rest of the transistors passed the test. I ordered the parts and replaced the affected transistors. It works! (kind of). The right channel and all other channels work. The left channel was extremely distorted on the A and B channels. This is where I shelved the project for awhile due to being very busy. I picked up the project again recently and fully completed the repair. I started by swapping ICs from the right to the left channel. Q501 (Power amp) with Q601 was the first swap. Did not affect the distortion. Next was IC414 (Volume control) with IC416 with no results. Then I swapped IC408 with IC410, no results. Finally, IC1510 with IC1508. None of these swaps affected the sound. I followed the IC chain all the way up until the selector IC. When I used the phone (headphone) jack on the front of the receiver, the quality was great without a speaker plugged into the left channel. As soon as I plugged a speaker into the left channel, the sound got distorted. The high impedance of the headphones did not perturb the circuit enough to make it distorted. The speaker with a low impedance (8 ohms) did. The sound from the phone jack was also ok with the RY501 and RY502 (left channel) output relay de-energized. I found the problem by checking the transistors again on diode mode. When I put the positive lead on the emitter and negative on the base on the MP1620 (NPN) transistor, I measured 0.8V forward voltage when the transistor was connected in-circuit. The left channel measured open-circuit with the same test. With the MP2488 (PNP) transistors, I measured reverse-biased again between the base and the emitter and measured 0.8V except for the left channel. 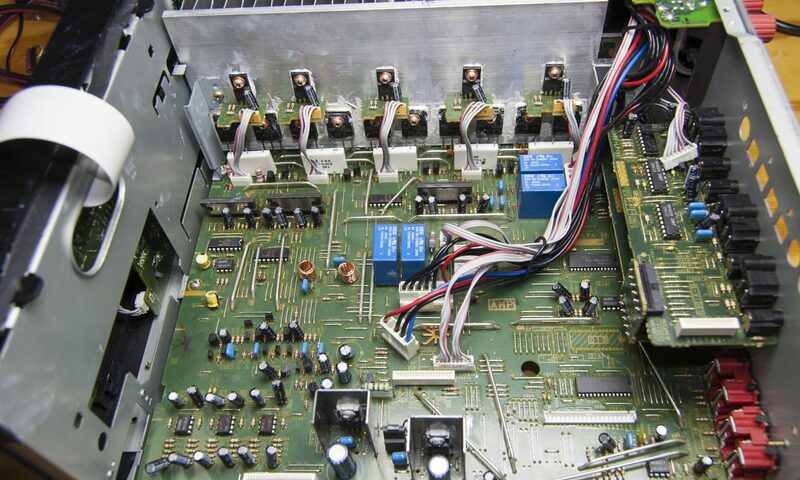 I then looked really close at the resistors/components on the mainboard around the transistors I replaced – Q506/Q507. R524 and R525 were slightly darker than the other resistors and measured open-circuit. These resistors control the base current going Q506 and Q507 from the bias circuitry (above the output transistors on the heatsink). Having the resistors open-circuit essentially disabled the high output power needed to drive a speaker. The only thing that was driving the left channel was the IC 501 power amp through a couple of high impedance resistors. No wonder the sound was distorted. With the resistors replaced, the receiver is repaired and works great. I replaced the resistors with 1/2 watt 100-ohm ceramic resistors (originally 1/4W carbon/ceramic). I found that if I flexed the front panel, the stereo would shut off or click its protection relays. This was due to dry solder joints on the front panel and volume potentiometer.